Another seagull, and another, I cannot catch them. They tease me, wait until I am almost within reach of those tail feathers. They open their wings and lift from the gentle waves, into the sky. And then a squirrel is swimming next to them…whimper, growl, yip, yip….HUH? WHAT? My Dad is in the waves next to me? What are you doing? Here? Oh, how embarrassing…I am dreaming and My Dad has been watching me, he is smiling, he places his gentle hand on my head. I love to go in the Scion xB to work with My Dad. I no longer need a leash for the short walk to Scion. The rear hatch opens and I jump right in. I sit behind My Dad’s seat and watch everything, herd the cars, move back and forth, window to window. Last Sunday, we drove to the South Loop area to serve paper. My Dad was thwarted by a security guard at this exclusive high-rise, but that story has yet to be written…My Dad is very imaginative…he chose me, right? And we went for a walk. 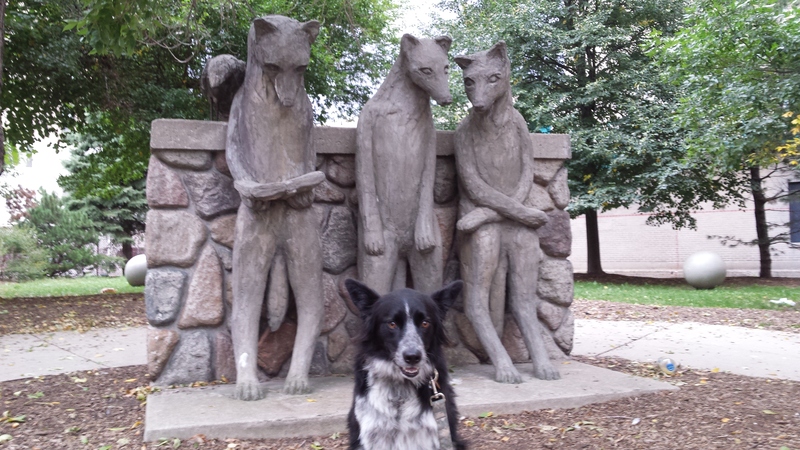 We found an interesting sculpture with three foxes, or are they Border collies? The northeast corner of East 11th Street and Wabash, just west of Michigan Avenue. My Dad thinks these are foxes…I thought Border collies, reading up on, and discussing herding techniques. This is the north wall of a 1960’s something parking garage located on East 8th Street, across from the Hilton Hotel on Michigan Avenue. East 8th Street, south of Hilton Hotel on Michigan Avenue. I was bored. 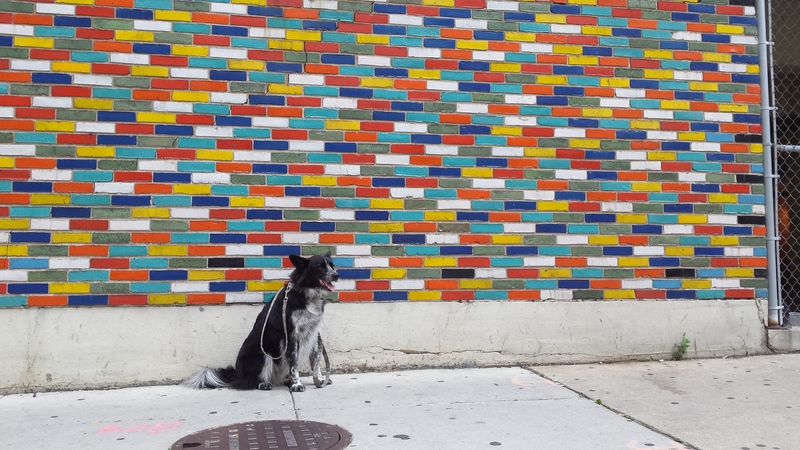 This entry was tagged border collie, border collie rescue, Chicago, dog behavior, dogs and people, frisbee dogs, herding dogs, pet photography. Bookmark the permalink. Love it, they are definitely Border Collies working out the latest herding techniques and squirrel catching too I bet. Love the pics of Chi town! Good evening, Hafeeza. Thank you. Do you have a new fur baby, yet?